The Verdict: The Norman Hotel is advertised as “Brisbane’s Worst Vegetarian Restaurant”. After this chicken parmagiana they may wish to add poultry to that tag line. Chicken: The chicken piece on the Norman Parma was well crumbed and on the large side. I am sure it had the potential to be quite good but I found mine to be over cooked and quite dry. Tomato Sauce: Are we currently going through a shortage of tomato sauce in Brisbane or just rationing and I missed the memo? The tomato sauce on this Parma was tasty enough but there just was not enough of it! Ham: The triumph of this meal was the ham. Where the sauce failed to provide coverage of the chicken piece the ham did in spades. Add to the quantum of ham the fact that it tasted great and it was the winner of the night! Cheese: See comments for tomato sauce above and repeat them here. What cheese there was well melted and complimented the ham well but I repeat the rhetorical question: are we an rations at the moment? Side dishes: The Norman Hotel’s Parma presented a new twist to the side dishes by including a baked potato instead of chips. It was not a good substitution. My potato, and those of my guests for the night, was cold when my plate hit the table. The salad, conversely, was excellent: it was fresh, plentiful and well dressed. I will ignore here the inclusion of a comically large half of a tomato because something so ridiculous, which I did not eat, ought not detract from a salad I really enjoyed. Presentation: With no chips on the plate there was ample room to place everything on it without the need to rest food on other food. This was a refreshing change. The Venue: I have noted the tag line above that the Norman uses in its marketing and it goes without saying that it’s steaks are of the highest quality. The Parma Consigliere’s steak was absolutely spot on. Keeping with the theme this month of trialling Parma’s at Brisbane’s hotel icons, the Norman, situated on Ipswich Rd in the ‘Gabba, is another establishment that has a long and rich history. Like others in the area it has been extensively refitted in recent years. $25.90 seemed a bit steep for my chicken Parma. The Final Word: The Parma Consigliere and I were delighted to host our friends from Canada, the Canns, at this week’s Parma test and introduce them to an Australian pub food staple. What a shame this Parma was just not very good! Dry chicken, limited sauce and cheese and a cold potato all made this a disappointing eating experience! 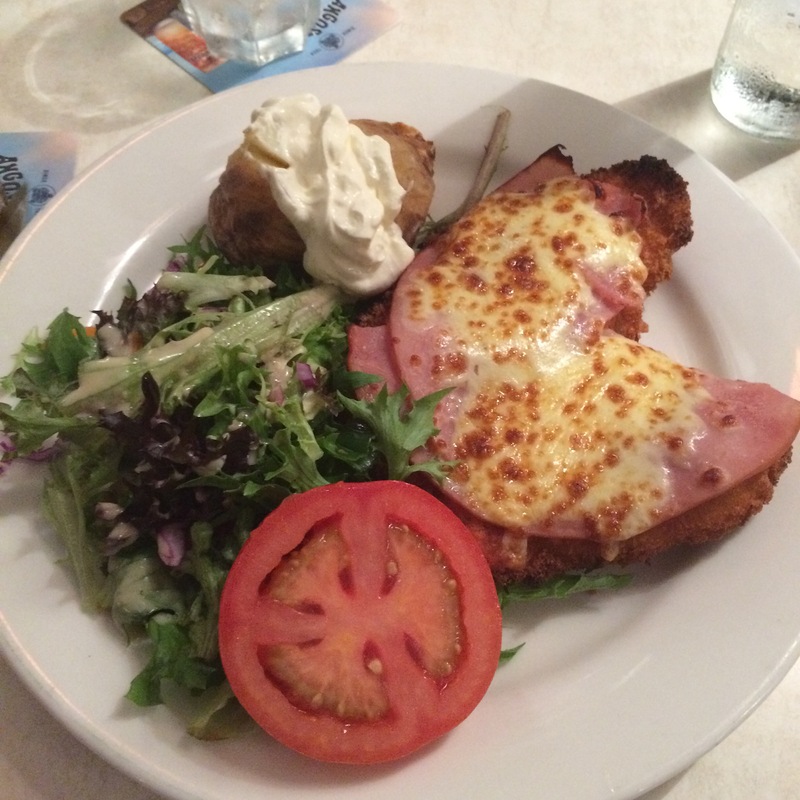 This entry was posted in Uncategorized and tagged Brisbane, brisbane's best, chicken, chicken parmigiana, food, the norman hotel. Bookmark the permalink.